Peter Schworm has an elegiac piece in today’s Boston Globe about the impending closure of a fragrant cocoa and chocolate factory that’s been operating in Mansfield, Massachusetts since 1903. The immediate impact is the loss of an olfactory landmark that has been a source of joy—and sustained employment—for over a century. Schworm claims some people don’t care for the scent of roasting cocoa, but everyone quoted in his article is positive about it, as are most of his online commenters. When this piece of the American smellscape ends its final evaporation, we will lose more than the chocolaty aroma. We lose the last perceptible connection to a great American success story of commercial innovation, hard-working immigrants, and civic-minded industrial philanthropy. The builder of the Mansfield plant was Walter M. Lowney, who had started a chocolate candy company in nearby Boston in 1883. Drawn to Mansfield by its available land and proximity to the railroad, Lowney became a legendary local figure. He donated land, helped create the town’s water and sewer system, and built a popular hotel and restaurant in the town center called The Tavern. He also built homes for his workers, many of whom were Italian immigrants who settled nearby in the town’s north end. 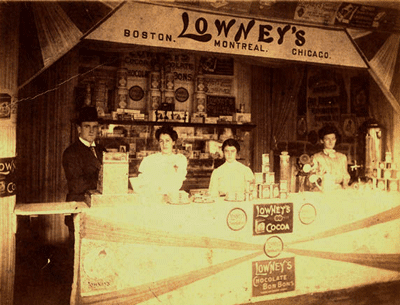 Lowney used the land across the street from the factory to raise cows, whose milk helped produce his premium chocolate, according to old newspaper articles. When he died in 1921, the entire town shut down to attend his funeral. was written by Maria Willett Howard, a protege of Fannie Farmer, and eventually used as a resource at the Boston Cooking School, where Howard began as a student and rose to be principal. This timeless cookbook offers such helpful hints as hosting formal dinners, using proper measurements, information on the butler’s duties, and an explanation on the growth of cocoa. From Pea Soup to Lobster Rissoles there are hundreds of recipes for both beginners and amateur chefs alike. A section on dessert offers dozens of sweet treats, including Sunshine Cake and Cocoa Ice Cream. Chocolate is the main ingredient in more than sixty of the recipes. 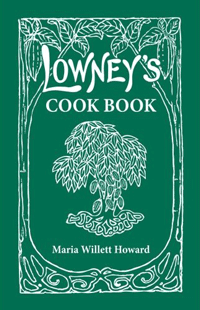 It was in this volume that Marie Willett Howard published one of the first recipes for brownies. The smells of American enterprise—chocolate factories, pulp mills and tanneries—are blinking out all over the continent. It’s a cause for nostalgia but also for questioning: Is our can-do spirit still intact? Will today’s Walter Lowneys survive the taxes and regulations that weigh them down? If the level of entrepreneurial energy hereabouts is anything to judge by, yes they will. There are plenty of aspiring confectioners, bakers and cheese makers stinking up the region. But it is sad to see those old businesses go, and the ridiculous regs are definitely a problem. I can't help noting, though, that there was always a downside. As a child, I lived for a few months in a house downwind from a pulp mill, which really was awful--and what's even more awful is the practice of clear cutting trees to feed those mills. The devastation is sickening. Can-do spirit sometimes wreaks havoc. That was a lovely piece. BG- I clearly see the conundrum. Smelt horrendous, like burnt corn cobs, it even seeped through windows, doors. Clearly a mixed blesing, with multiple aspects worthy of consideration. browniesssssssssss where??????? I need them now!! !